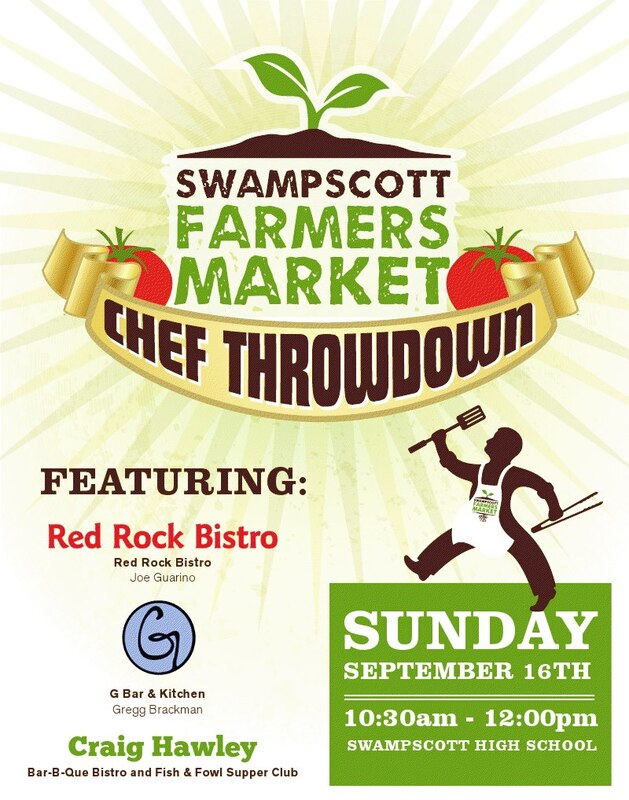 If you’re a fan of reality shows like “Chopped” on Food Network, we suggest you get yourselves to the Swampscott Farmers Market this Sunday for their Chef Throwdown, which promises to be quite entertaining. The competition will feature three local chefs: Joe Guarino of Red Rock Bistro, G Bar & Kitchen’s Gregg Brackman, and Craig Hawley of the Bar-B-Que Bistro and Fish and Fowl Supper Club. Each contestant will be given $35 and 15 minutes to peruse the market for ingredients; they must purchase items from at least four vendors. John Crow Farms will provide a still-to-be-confirmed protein. The chefs will have one hour to prepare their meal in a very limited space. Extras provided by the market are limited to salt, pepper, olive oil, butter, water, and plates. Contestants are allowed to bring one ingredient from their own kitchens, but that item may not constitute more than 25% of the dish. Judging will be based on taste, use of workspace, and creativity and presentation. We are very excited to have been asked to participate in the judging and yours truly will be joining Julie Pottier-Brown, Manager of Farm Direct Coop, and Swampscott’s Matt Strauss, former selectman and hospitality executive for over 20 years, to do the honors. The market is open rain or shine Sundays from 10:00 to 1:00 at the Swampscott High School, 200 Essex Street. The Chef Throwdown will start at 10:30 when the bell rings for the chefs to begin shopping. Cooking will take place from 11:00 to 12:00, then the tasting and judging will begin. If you’re in the area, stop by to say hello, cheer on your favorite kitchen wizard and pick up some fresh produce at the same time!